SPECIAL VALENTINES' DATE NIGHT! This is a Couples' Painting Party: each of you paint one canvas, the two canvasses side-by-side make a complete piece of art! 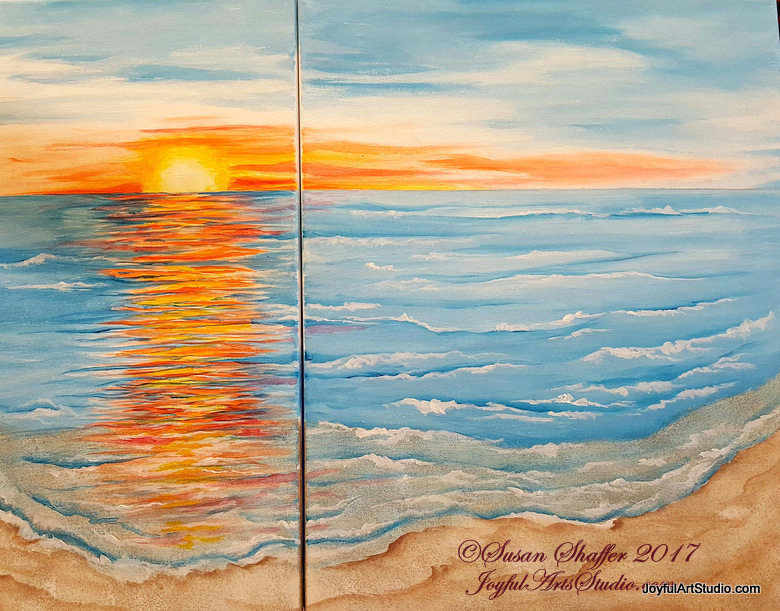 We will be painting a vibrant sunset over the gorgeous blue ocean waters and beach. The canvas on the left is 10 x 20 and the right canvas is 16 x 20. The canvas design can be left as is or feel free to add your own designs in the sand, foot prints, beach chairs, sea shells, a heart drawn in the sand with your names, and perhaps a bird in the sky. All supplies, paints, brushes, step by step written instructions and photos will be provided. Light refreshments will be provided. Be sure to bring your favorite beverage, we'll have the wine glasses.